Original stories are tough to make. Just ask Hollywood studios, who, in their push for greater and greater profits, have seemingly decided that these fabled creations are nowhere near as lucrative as comic book cash-ins, lazy remakes, and even movies based on board games. The anime industry has faced a similar conundrum in recent years, with more and more of the industry taken up by adaptations of manga, light novels, and video games. That's what makes Kenji Kamiyama (Ghost in the Shell: Stand-Alone Complex, Seirei no Moribito) and Production I.G's Eden of the East franchise shine so brightly to so many critics—it is an entirely original story created for the purpose of this anime, and this anime only. While the TV series wasn't quite perfect, it was a great proof of concept for Kamiyama as an original storyteller, and I was excited to see how he would finish the epic story that the series started. Unfortunately, the first Eden of the East movie, subtitled The King of Eden, stands as proof that getting an original story right takes a lot more than some slick directorial work and clever scripting. It's been six months since the events of Eden of the East. The "Noblesse Oblige" game, in which 12 unwitting victims (called Seleção) have been burdened with ten billion yen, a concierge that uses that money to carry out their every whim, and an obligation to "save Japan," is still in progress. The remaining Seleção, those who were not killed or otherwised removed from the game during the series, are still trying to track down the "Supporter," the one player among them who supposedly kills each Seleção when their funds run out. Takizawa, the quirky young man who served as our protagonist for the TV series, has gone missing, and his records show that he gave an order to his concierge to turn him into the "King of Japan," an order that apparently involved wiping his memory and giving him a new name (again). 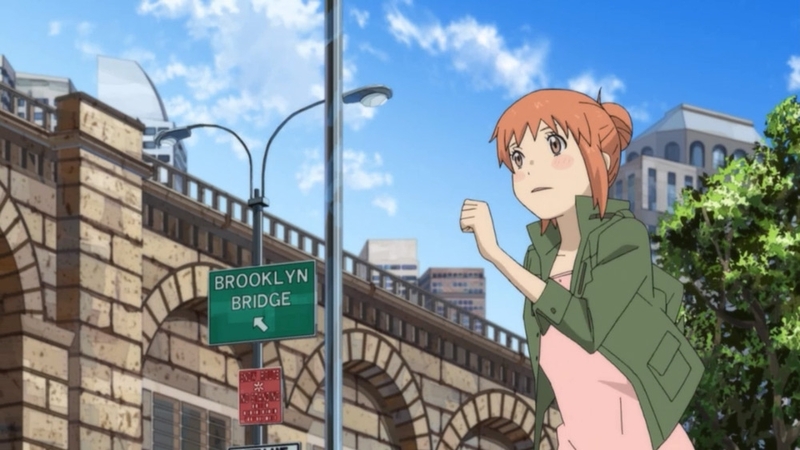 Our story opens with Saki, a recent college graduate whose budding romance with Takizawa flung her into danger during the Eden TV series, trying to track him down in New York City. From the get-go, I was stunned by Kamiyama's attention to detail. New York looks spot-on, from the EZ-Pass toll booths to the NYC Taxi logos to the diffused lights in the windows of apartment buildings. Yusuke Takeda's (Giant Robo, Ghost in the Shell: Stand-Alone Complex, Gankutsuou) art direction strikes a delicate balance, creating scenes that are believable, but not so photorealistic that they're distracting. It's that sort of delicacy that characterized Kamiyama's work on the TV series as well, and it follows through to the film. Takeda's backgrounds mesh perfectly with Kamiyama's screenplay and Satoru Nakamura's (Ghost in the Shell: Stand-Alone Complex) animation direction, which focus on a sort of slightly cartoonish realism. City streets look like real city streets, characters talk about taxes and politics like real people, and technology works the way real technology works (with some exceptions). There is comedy to be had among the drama, however, and this adds that splash of silliness that keeps the film from going too deep down the rabbit hole. He may have the execution perfectly mastered, but a flawless genius Kenji Kamiyama is not. While each piece of the story is compelling in its own right, they never really mesh into a cohesive whole. Furthermore, the central conflict is never clear, since the most threatening villains are either off doing things unrelated to the main characters, are shown to be harmless fools, or are turned into good guys! In the end, there's not much to actually be worried about, since the protagonists are never in any real danger. Look at this! I've gotten six paragraphs into this review without mentioning that amnesia is the most lazy way to start a follow-up to a popular TV series. Once they meet back up, Saki and Takizawa's relationship ends up being essentially the same as it was at the end of the show, so amnesia doesn't even seem to be a way out of some inescapable plot cul-de-sac. Building on the existing character relationships and simply moving ahead with new challenges would have made for a much more interesting film, and I don't really understand why Kamiyama didn't go down that route. 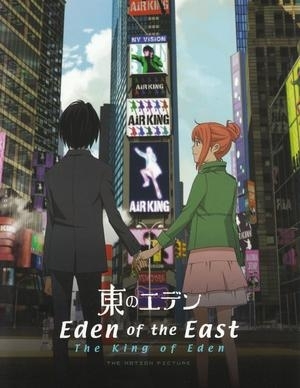 FUNimation's dub is a little overacted at times, as was the case for the original Eden of the East, but some of the more subdued roles, like Saki (Leah Clark), Takizawa (Jason Liebrecht), Hirasawa (J. Michael Tatum), and the sultry concierge Juiz (Stephanie Young) convey the tone of the story quite well. Unfortunately, the occasional odd deliveries mean it's going to be tough for non-anime fan types to take this seriously, despite the very Hollywood-style premise of the series. The true finale comes in the second movie, so I will reserve my judgment on the entire series until I see it. However, The King of Eden is a weak follow-up to the already somewhat unsatisfying TV series ending. While it continues to prove that Kenji Kamiyama is a competent director who can construct beautiful ambiance and believable character relationships, the movie also seems to pull away the curtain on his seeming inability to tie up a complex, original narrative. Unless you're someone who really loved the TV series, this film's not for you. This review is based on a Netflix stream from the reviewer&apos;s personal Netflix account.